Welcome to MICRO CONTROL SYSTEMS LTD.（MCS）overseas website. MCS management philosophy is to provide products that contribute to the realization of an environmentally friendly eco-society where people can safely live. MCS will respect the environment and continue business activities to respond to social needs. MCS is a company that provides products that contribute to the eco environment society. We will provide new innovation products with reliable technology and reliable performance and quality as our motto. The left photograph shows MCS LED light lens that shines like jewels. 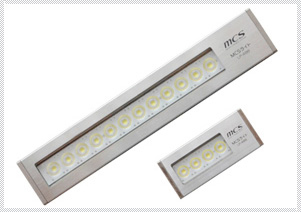 MCS lights are LED devices using MCS original LED lens which can Illuminate wide and long distance region. With changing the optical axis of the LED lens, required luminance is obtained on the required place. This products can be used in harsh environments such as outdoor lights, under tunnel lights and highway tunnel lights. The LP-4x series(LP-488,LP-489 etc) are high-performance MCS LED light equipment specialized for machine tools. MCS LED lights can be used under harsh environments (IP-67 standard). This movie is MCS message from Japan to the world. Copyright© MICRO CONTROL SYSTEMS LTD. All Rights Reserved.